Check this page for other language bindings (Delphi / D / Go / .NET / Python / Rust). Check screenshot gallery of the desktop UI examples and DirectX UI integration via Rust GFX. Persistent Database (a.k.a. JSON DB) based on excellent DB products of Konstantin Knizhnik. Graphics module that uses native graphics primitives provided by each supported platform: Direct2D on Windows 7 and above, GDI+ on Windows XP, CoreGraphics on MacOS, Cairo on Linux/GTK. Yet there is an option to use built-in Skia/OpenGL backend on each platform. Network communication module, it relies on platform HTTP client primitives and/or Libcurl. CSS – CSS parser and collection of parsed CSS rules, etc. HTML DOM – HTML parser and DOM tree implementation. layout managers – collection of various layout managers – text layout, default block layout, flex layouts. Support of positioned floating elements is also here. This module does layout calculations heavy lifting. This module is also responsible for rendering of layouts. input behaviors – collection of built-in behaviors – code behind "active" DOM elements: <input>, <select>, <textarea>, etc. script module – source-to-bytecode compiler and virtual machine (VM) with compacting garbage collector (GC). This module also contains runtime implementation of standard classes and objects: Array, Object, Function and others. script DOM – runtime classes that expose DOM and DOM view (a.k.a. window) to the script. core primitives – set of common primitives: string, arrays, hash maps and so on. Sciter supports all standard elements defined in HTML5 specification with some additions. CSS extended to better support Desktop UI development, e.g. flow and flex units, vertical and horizontal alignment, OS theming. Check https://sciter.com website and its documentation resources for engine principles, architecture and more. 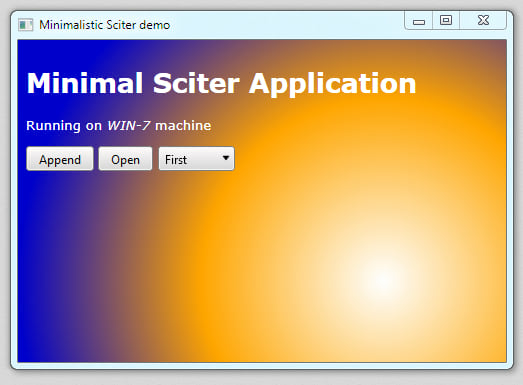 Download Sciter SDK and extract it somewhere. Add target platform binaries to PATH (bin, bin.osx or bin.gtk) and install Sciter shared library to your LIBRARY_PATH (the latter is not required if you build crate with --features "dynamic" enabled). Build library and run the minimal sciter sample: cargo run --example minimal. For your apps add the following dependency to the Cargo.toml: sciter-rs = "*". // `view` represents window where script is runnung. Check rust-sciter/examples folder for more complex usage. Bindings library licensed under MIT license. Sciter Engine has the own license terms and end used license agreement for SDK usage.